I think that I cannot preserve my health and spirits unless I spend four hours a day at least — and it is commonly more than that — sauntering through the woods and over the hills and fields absoutely free from all worldly engagements. I can easily walk ten, fifteen, twenty, any number of miles, commencing at my own door, without going by any house, without crossing a road except where the fox and the mink do. First along by the river, and then the brook, and then the meadow and the wood-side. There are square miles in my vicinity which have no inhabitant. In my corner of the world, there are still places where it is possible to walk for some distance without seeing a house. I can even walk to some of those places from my own house, although I have to pass by many houses on the way to the trailhead. I wouldn’t want to live in total wilderness or total solitude, so that’s all right by me. Yet, like Thoreau, I do find peace and inspiration in those places that have not yet lost their wildness. At walking speed I see things that I would have missed while running or cycling. Recently I spent a few moments watching two river otters in full courtship dance. No photos, sorry… while I’m watching something like that, reaching in my pocket for my phone to take a photo is the last thing on my mind. 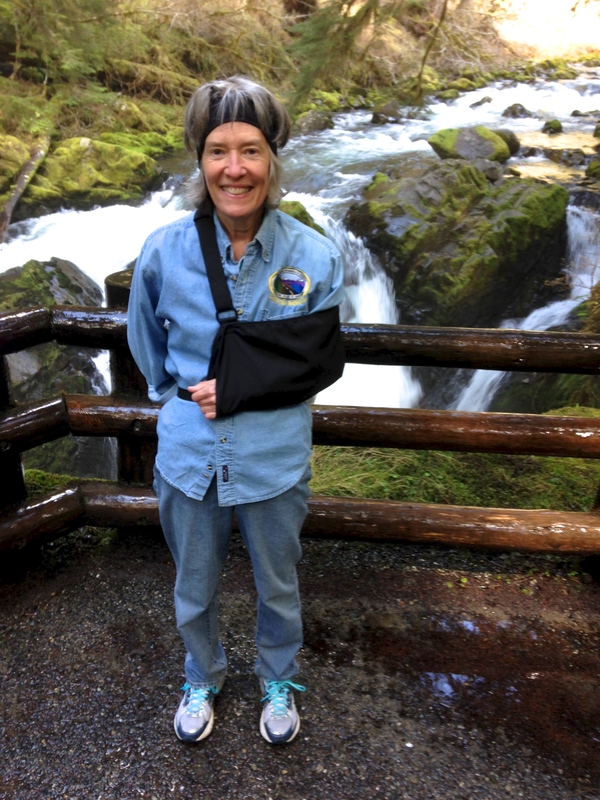 In an effort to make peace with the place where I fell and broke my arm, I have hiked several miles of the Olympic Adventure Trail. It’s an easy, pleasant, relatively level trail. 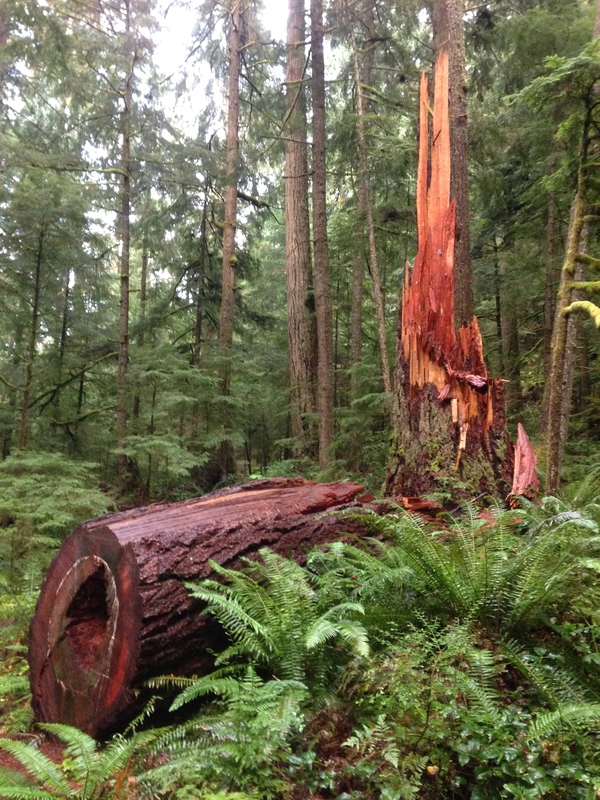 In several places the trail meanders through recent clear cuts — so it’s not exactly pristine — but those clear cuts open up views southward to the Olympics or northward to the strait and Vancouver Island. At walking pace I was delighted to find calypso orchids on the OAT! 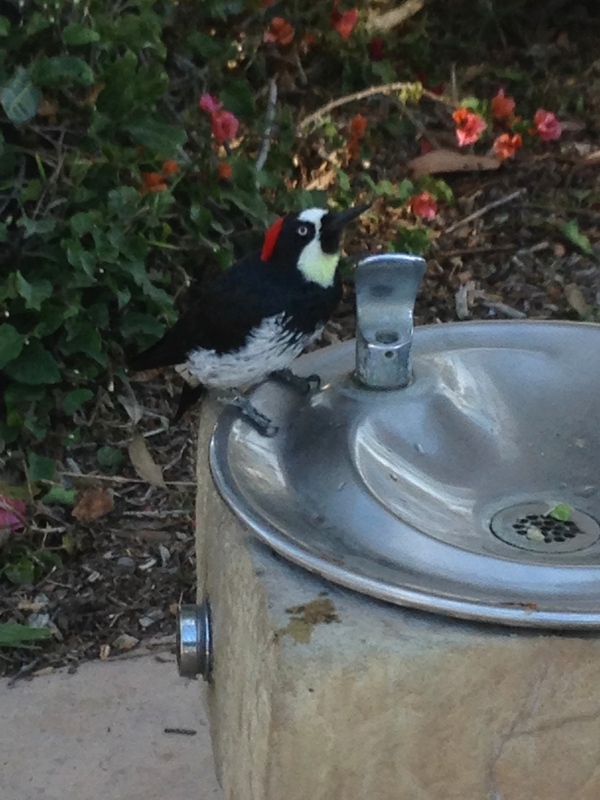 There are at least 100 of them in the first mile from the trailhead. I have never noticed them on this trail before. I’ve often put orchid photos in this blog, but to refresh your memory here is what they look like. They are tiny flowers, not much more than an inch across. The other day on the OAT, in the midst of all of these “normal” calypsos, I came across a pair of unicorns. 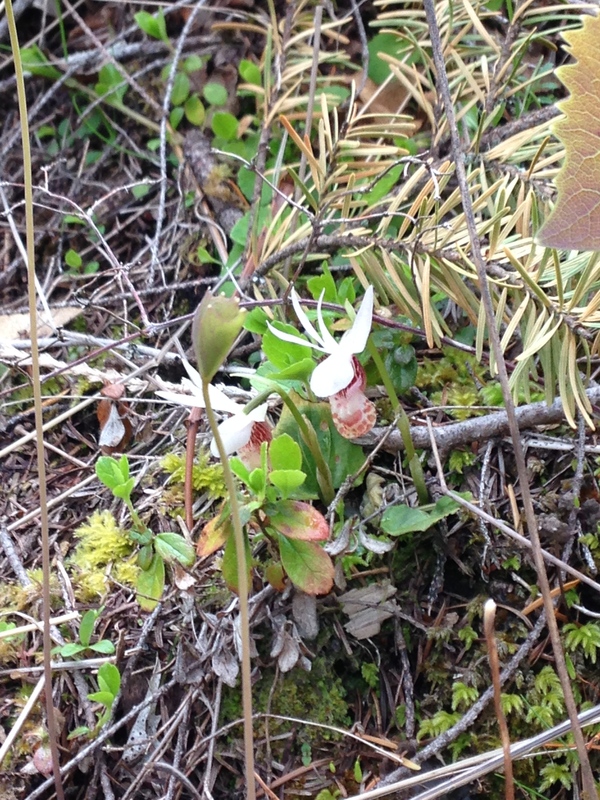 Those, my friends, are “albino” calypso orchids! It’s not the greatest photo, but I hope you can see that the outer petals are pure white while the inner petals are muted compared to the “normal” flower. 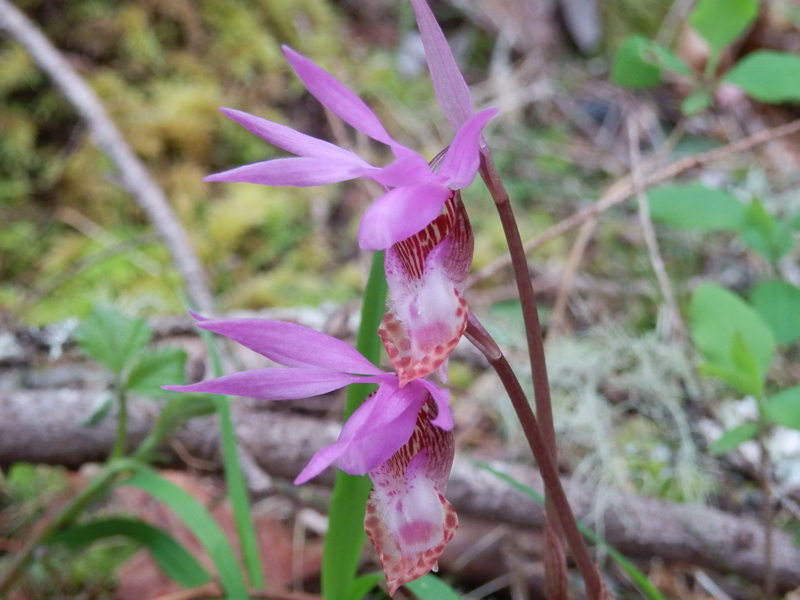 Over the past three years I have inspected hundreds of calypso orchids but I’ve never seen any like these before. 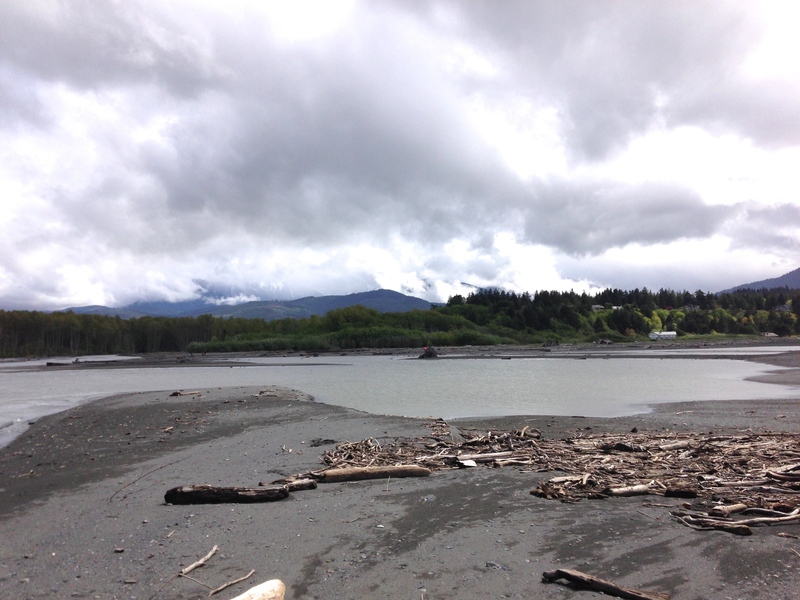 Yesterday we went out to the mouth of the Elwha River. I haven’t been to the mouth since before the dam removal project began. 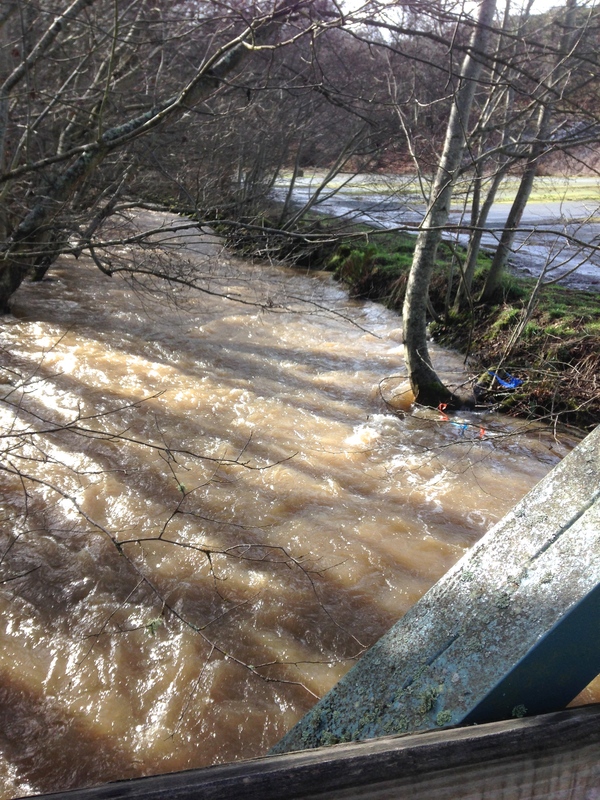 The mouth is now at least a quarter of a mile north of where it used to be! 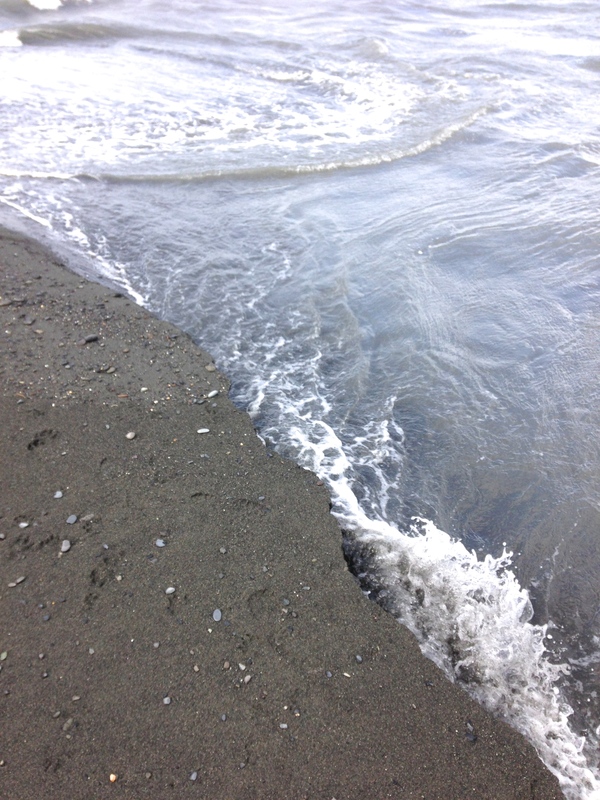 The silt that has flowed downriver from the dams has created a broad, easy-walking silty beach. At the water’s edge the river and the tide are joining forces to create small canyons, cutting vertical mini-cliffs through the silt. I took this photo looking straight down. The water here is about a foot below the edge of the silt. The configuration of this river delta changes from day to day, but the clear trend is growth of the land northward into the strait. A few hours after I took these photos, I was standing on a high ridge line looking down toward the strait, where I could clearly see the river’s current fanning out and outlined against the saltier water of the strait. While I deeply miss running (and eagerly look forward to the day when I’m cleared to run again), I’m finding deep happiness in hours of leisurely walking. These are all steps in my journey, and each of them is to be savored. There is no going back, no other way but forward. that will never be trod again. Slow and happy — here’s to the joy of walking! A habit, once formed, can be a tough thing to break. I like to think that CFL’s and my activity streak is a good habit! I’ll confess that when I first broke my arm I had a tough time motivating myself to get outside and do something. But once I got used to my new temporary “normal,” I stopped feeling sorry for myself over my inability to run or cycle. I discovered that I enjoyed the challenge of finding interesting new ways to move for several miles each day. During the first several days after my injury I was happy just to walk on a flat paved surface. Together we walked several sections of the Olympic Discovery Trail. I know that trail very well from many hundreds of running miles, but it’s been nice to slow down and share it while engaging in long, slow conversations. Although I wasn’t able to capture them on camera (I struggle getting off quick one-handed shots), at the Morse Creek bridge we saw three adult bald eagles and a river otter. As a consolation prize I’ll offer you a long, slow look at the shadows on the bridge. After five days and 28 miles of this leisurely walking, I was ready to try a bit more. First up was a short hike to the always-spectacular Sol Duc Falls. It’s only 1.8 miles round-trip on a mostly level trail. 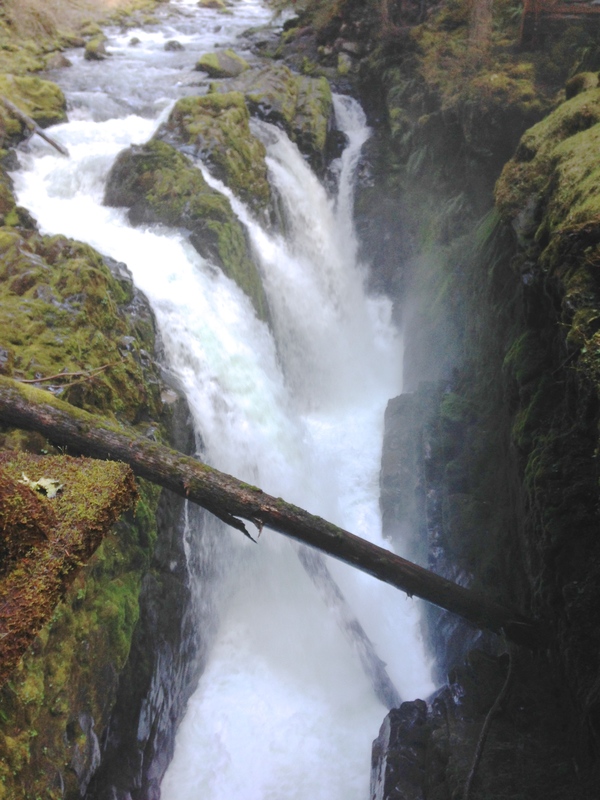 Thanks to all the recent rains, we passed several raging streams on our way to the falls. The scale is difficult to capture in a photograph because the trees are so huge, but this stream is about 20 feet across. Sol Duc Falls itself was as high as I’ve ever seen it, with four cascades instead of the usual three. I must thank CFL for the spiky hairdo he gave me when he put on my headband for me. 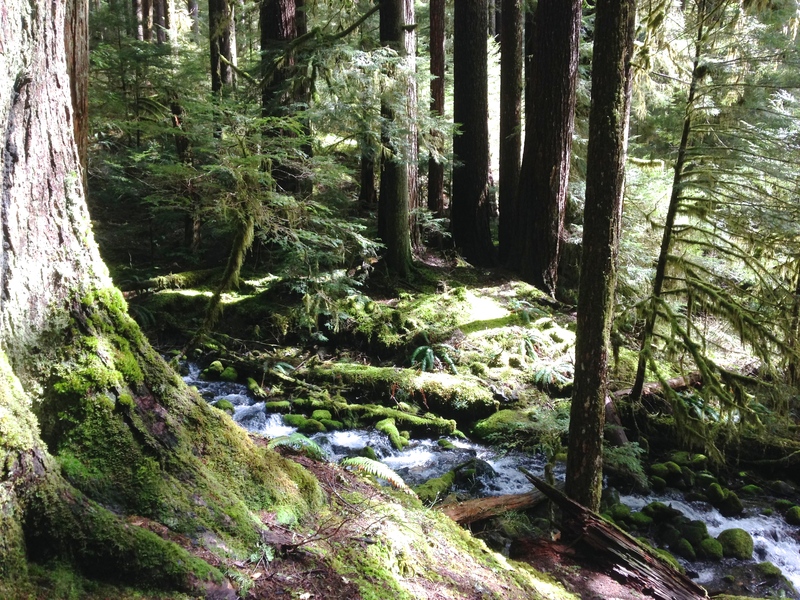 Sol Duc Falls served as a warm-up. That same day we also hiked several miles on a new (to us) and mostly level trail not far from this one. The next day we chose a trail that soon turned into an impassible marshy puddle. We were disappointed with our low-mileage day, so the next day we covered 12.5 miles on the ODT before rewarding ourselves with local craft beer downtown. Over the weekend we hit the hiking trails again. On our 11.5 mile meander along the Spruce Railroad Trail, we enjoyed the impossible-to-photograph deep ultramarine blues of Lake Crescent. 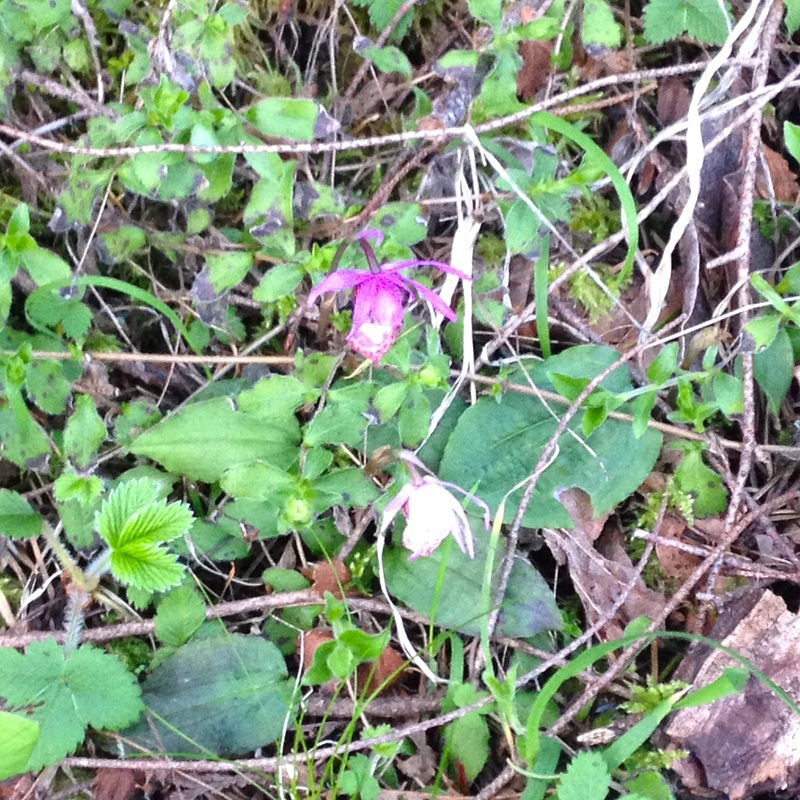 We also spotted our first calypso orchids of 2014! 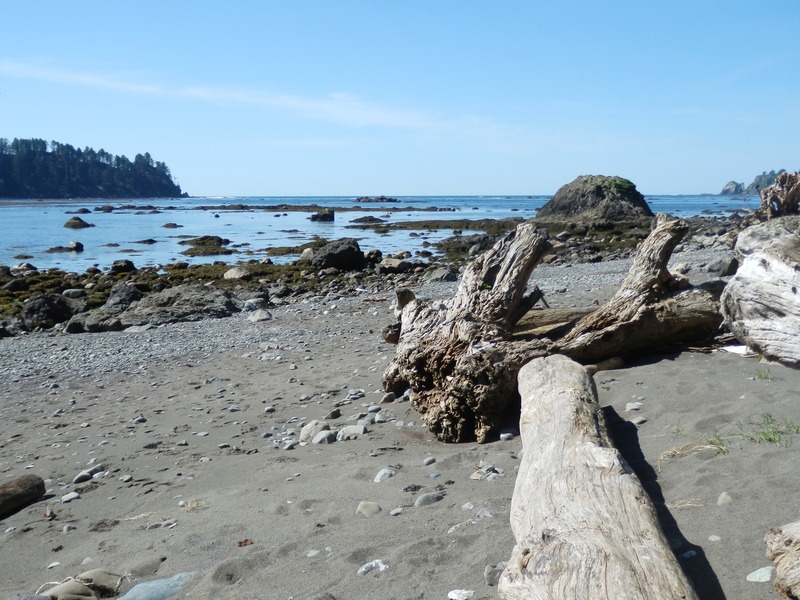 Yesterday we drove way out to the Pacific coast to hike the Ozette Triangle. 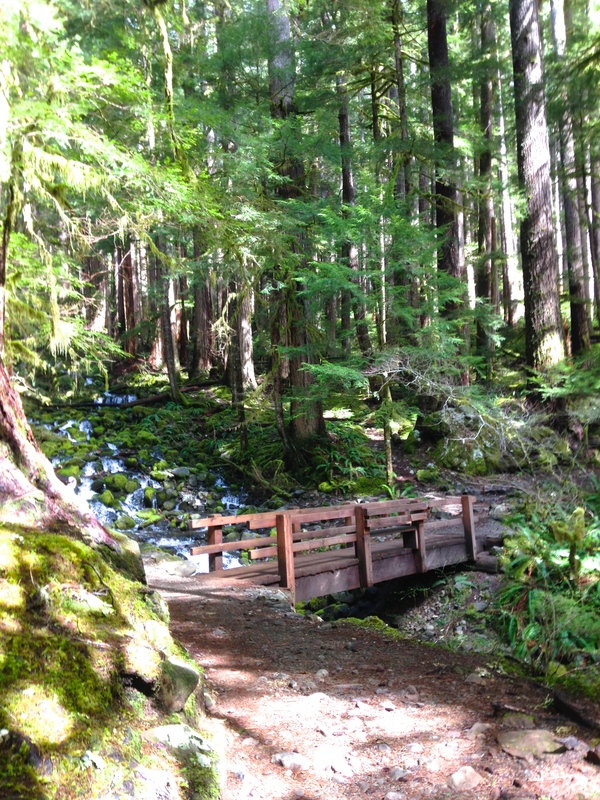 This trail starts at Lake Ozette and runs west 3 miles through the forest to the beach, then 3 miles south along the beach, and finally 3 miles back through the forest. I did fine on the first leg. When we got to the beach, I felt like I had just stepped into a calendar photo. We stopped to snack and enjoy the view. There were many kinds of waterfowl, including dozens of black oystercatchers with their distinctive whistles. We heard sea lions barking at a near-shore island. We saw several gray whale spouts just beyond the surf line. 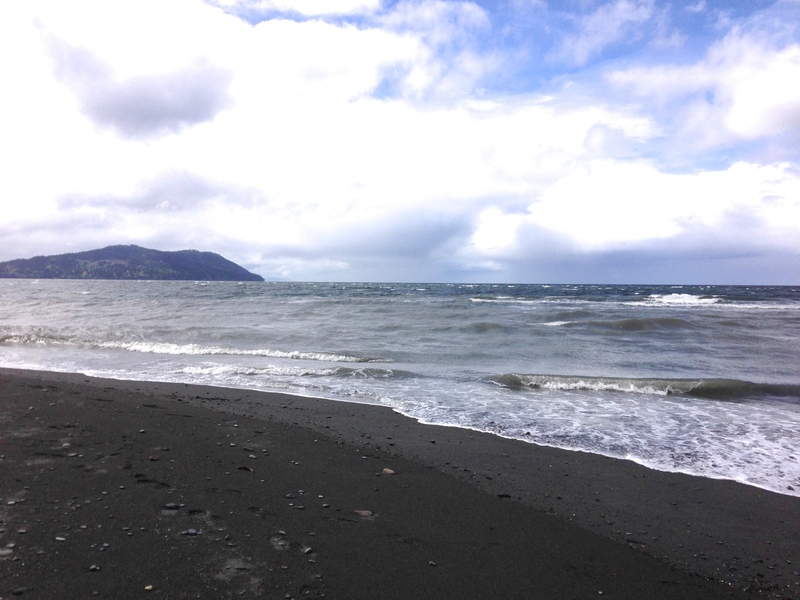 We then set out to walk along the beach. At first it was mostly sand and cobbles, but we didn’t get far before we found ourselves stepping from boulder to boulder and scrambling over driftwood logs. I quickly realized that this was going to be too tough to navigate with my arm in a sling. We reluctantly turned back. By the time we got back to the car, we’d covered 7.5 miles, but I was very tired. Still, it occurred to us that we were the oldest people out on that trail that day — by far. I was also the only person out there with a broken arm! So we congratulated ourselves on our attempt. All told, I’ve walked (on pavement) and hiked (off-pavement) nearly 72 miles in the first ten days since breaking my arm. I may have been slowed by this injury, but I shall not be stopped. One slow happy step at a time! I had good news and bad news from the orthopedist yesterday. if I feel any pain, stop doing whatever triggered the pain. She encouraged me to walk as much as I like and was agreeable to the idea of a bike trainer (a device that turns your bike into a stationary cycle machine) as long as I don’t use my left arm. I don’t yet own a bike trainer but now I’m looking into getting one! She did warn me that I’ll quickly lose muscle strength and endurance over the coming weeks, and that I should not be looking for another PR when I run (or walk… we’ll see…) the NODM half marathon on June 1. My arm broke in a way that should not have happened from a “standing fall.” That is, the force of the left forearm hitting the ground is not normally enough to crack the humerus where it meets the shoulder. However, I was running (which added X amount of force) slightly downhill (which added another Y amount of force). You’ll remember from your high school algebra that X and Y are unknown and variable. Maybe it was enough force to justify the break, or maybe not. We don’t have any data on the forces at play in this case. But I have a history of a previous fracture that “should not” have happened. I broke a bone in my left foot when I missed the last step of a flight way back in 2001. The chronic, lingering foot pain after that accident was the very thing that inspired me to start running in the first place! Now after 5+ years of fracture-free running I may have increased my bone density from the hips down. Everywhere else may be a different story. As I say, this doesn’t come as a surprise. I run, cycle, hike, and walk with a conscious awareness that these activities are good for my bones (and for lots of other reasons). But somehow I’ve never gotten sufficiently motivated to do any weight training or other exercise above the hips. All of that is about to change. Time to break out the hand weights! Time to start hiking with a heavier pack! I’m scheduled for a bone density test in a few weeks. I’ll be tested in at least two places (my wrist and somewhere lower) so I’ll get an idea of how helpful the running has been for my bones. After that, I suppose there will be a treatment plan, which I hope will include an exercise program to limit the damage and keep me as active and healthy as possible. I recently met a runner who took up running after her osteoporosis diagnosis and is doing just fine. So I have every reason to be optimistic. Meanwhile I’ll start physical therapy on my arm on April 17, which will be two weeks after my injury. I’m looking forward to that! And later on this misty, mild April afternoon I’ll go for a nice long walk. The activity streak shall endure. February can be tough sometimes. While the days are getting noticeably Ionger, winter still packs quite a punch. It can be difficult to motivate myself to get out there and stay active when the temperature is in the high 30s and the sky is gloomy with an intermittent drizzle. I confess, there are days when I just want to say “curse you, Activity Streak!” and snuggle more deeply into my favorite reading chair. CFL and I recently made a quick trip down to southern Oregon to visit my dad. We contemplated bringing our bikes along, but then decided we’d just take it easy with long walks. We eagerly anticipated walking around downtown Eugene and Portland, stopping to take in a few local breweries and taprooms along the way. All went as planned in Eugene, on the outbound leg of our trip. We enjoyed sharing flights of beers at Oakshire Brewing and Hop Valley Brewing, and had a great dinner at The Bier Stein, a brewpub boasting 24 taps and over 1,000 types of bottled beer. Coming back northward toward Portland, however, we got caught up in heavy snow. We never had to put on chains, but trucks and cars pulling trailers did. 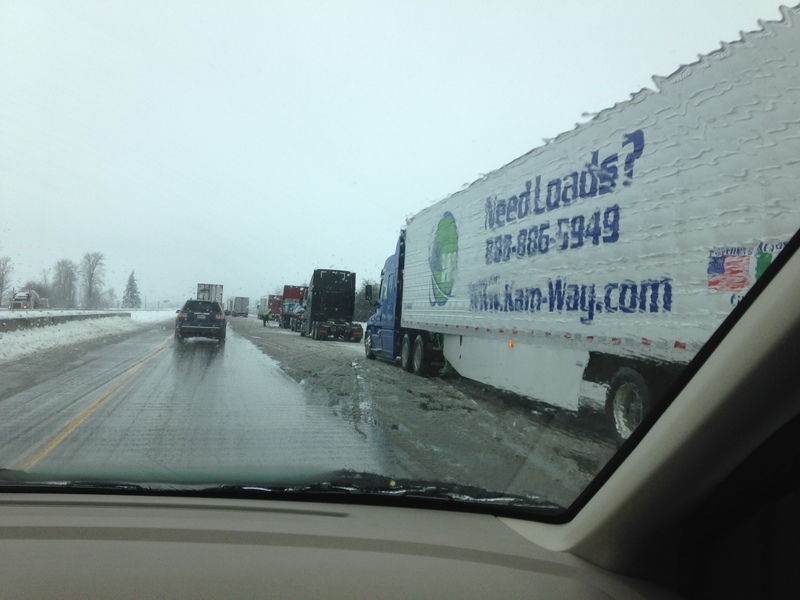 At one point I-5 was blocked completely, with truckers stopped in the middle of the freeway to put on their chains. It took us two hours to drive five miles beyond the place that I took this photo. By the time we reached Portland, we were in the midst of an ice storm. We crept into downtown, trying not to slide sideways on some of the same bridges that we’d pedaled over happily on our bikes during the Bridge Pedal last August. We’d booked a room at the same motel we stayed at last summer. From this location it’s a quarter-mile walk to a light rail station that would take us directly to the middle of downtown. We were hungry; I eagerly anticipated a great dinner and an awesome IPA at Deschutes Brewery’s Portland brewpub. The slightly frazzled reception desk clerk assured us that no matter how bad the weather, the light rail never shut down, thanks to super-duper new defrosting technology. So we bundled up and set off toward the train station. It was 21 degrees with a 19 mile per hour wind. Freezing rain lashed our faces as we stumbled intrepidly to the station. We bought our round-trip passes and stood on the platform with a couple dozen other hardy souls. Then we began to hear rumblings: “We’ve been standing here for an hour.” The marquee display still indicated the expected arrival time for the next train, so we figured all those people had just lost track of time! Then the marquee display changed. All trains in the system were shut down. By this time we were very cold and very hungry. We trudged back. Earlier we’d heard that only one restaurant in the immediate area of the motel was open. It was a steakhouse, about two blocks past the motel. To get there, we had to walk into the blistering wind and navigate sidewalks and parking lots that were in the process of becoming encased in half an inch of ice. By the time we arrived, my jacket was frozen stiff. It turned out to be a steakhouse of the old-fashioned sort, meaning there was nothing for this vegetarian to eat but fries. The fries tasted a bit fishy but at that point I really didn’t care. Fortunately they did have some interesting beers on tap! The next morning our phones awoke us with an emergency alert imploring everyone in Portland not to go out if at all possible. 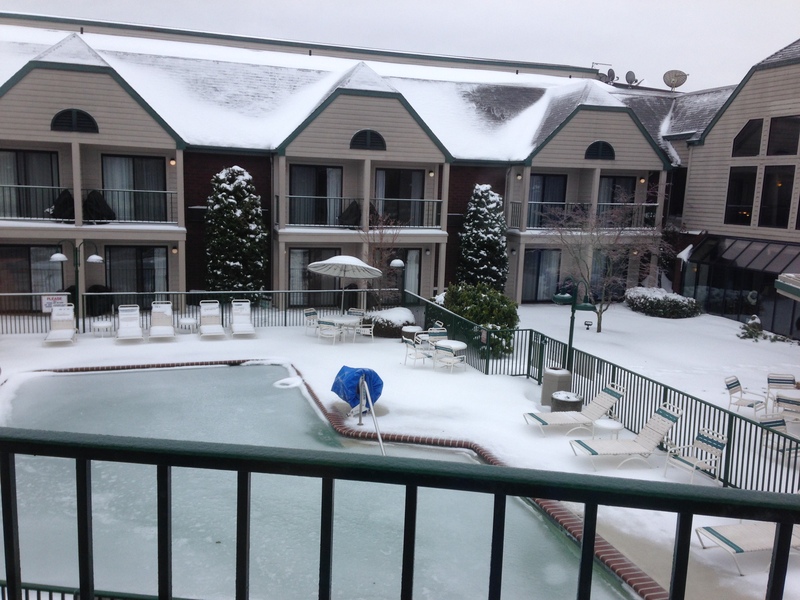 We hung out at the motel until almost checkout time enjoying the view of the iced-over pool. We then decided to make a run for it. Getting out of the parking lot was a bit scary but once we were on the freeway it was fine. By the time we were fifty miles into Washington, we had left most of the snow behind us. Since then it’s rained every day here at home. I got my new bicycle on February 1 but so far I’ve only managed to ride it 25 miles, mostly right around the immediate neighborhood. I surprised myself by buying a road bike. I didn’t think I wanted drop handlebars, but when I thought about what I enjoy doing on a bike — riding fast and riding long — a road bike became the obvious choice. I’m gradually getting used to the more aggressive riding posture. Mostly I keep my hands up top, but on a long flat stretch (which is scarce in my neighborhood) I can inch them down into the dropped position. Going downhill is still scary though! Fortunately, going uphill is much easier than it was on my old bike: that’s when I really notice that it weighs 19.5 pounds compared to my old bike at 33 pounds. I’m going to need that lightness and quick acceleration this coming Sunday when — whatever the weather — CFL and I will ride the Chilly Hilly. 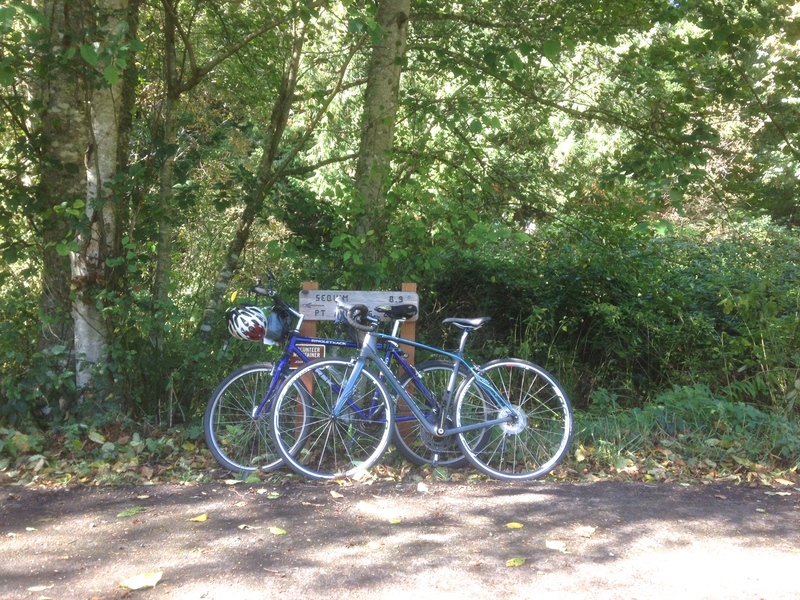 At 33 miles around Bainbridge Island with a total elevation gain of 2,675 feet, it will be my hilliest bike ride ever! I just wish I had more time between now and then to get comfortable on my new bike. But it does get tough to get out there and feed the activity streak when the weather is lousy. This morning during a sunbreak I got out and ran along the waterfront. Thanks to all the rain, Ennis Creek was higher than I’ve ever seen it before. 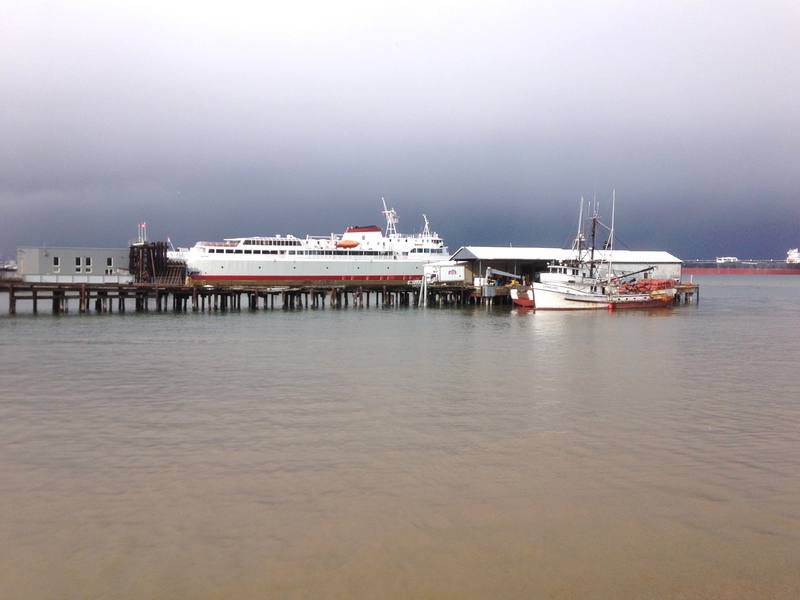 During the last mile of my run, dark clouds loomed over the strait, the wind picked up, and the rain began. I caught this shot of sun, rain, and oncoming storm clouds during my after-run stretch time. There was a flock of surf scoters in the water near the pier. I noticed with delight that the birds were forming boy/girl pairs. Spring is coming, and love is in the air! Tomorrow is another day! It will be activity streak day #414 to be precise. I don’t know yet how many miles I’ll be able to fit in, but one way or another I know I’ll drag myself out there and do something. What about you? How is the dead of winter treating you? Any signs of spring yet where you are? Days and miles — flying by! Wow! Three weeks into the new year and I’m finally finding time to do a little blogging. I always take it as a good sign when I don’t have time to write — it means I’m out there squeezing every bit of life out of the hours and moments of each day. Today marks 21 days into the new year, and I’ve already logged 168 miles. Wow! I’m averaging 8 miles a day! I don’t think I can maintain this pace indefinitely. On the other hand, once I start doing some long bike rides I’ll possibly move the average mileage even higher. 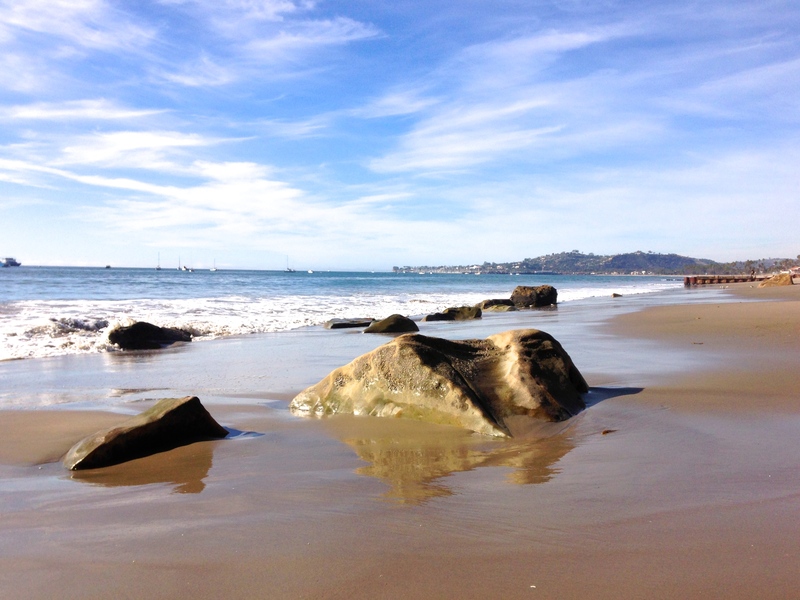 I did my traditional “January in Santa Barbara” trip recently. Unlike last year, which was very windy, the weather was perfect! I ran all four of the days I was there, including three simply wonderful barefoot runs on the beach. In past years I felt like a hero if I could manage a mile of barefoot running; this year I did beach runs of 2.5, 3.25, and 3.7 miles. I continue to be amazed at the things I can do that once were out of reach. It was a warm day and she was determined to drink, so she was patient with me while I took several shots. During my time in Santa Barbara I managed to sneak in a couple of visits to Santa Barbara Brewing Company, where I sampled several of their excellent beers. What is a vacation without a little beer tourism? 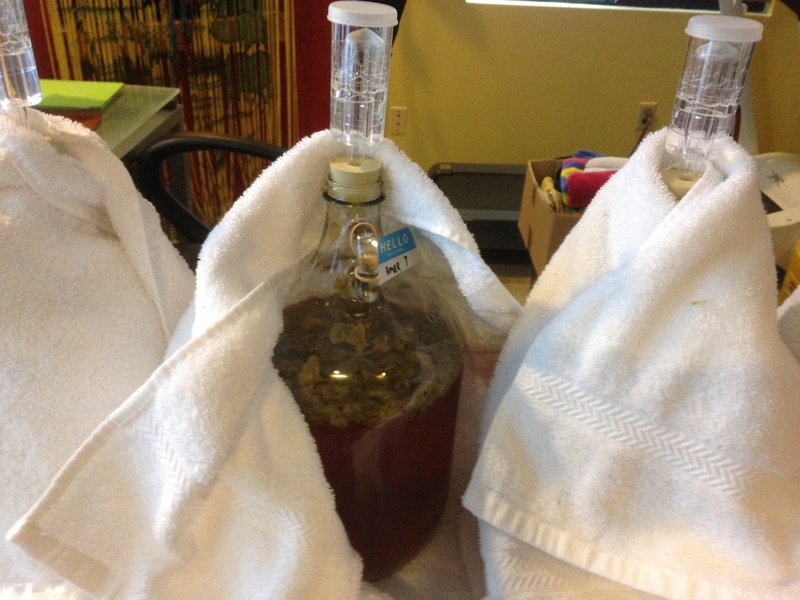 Speaking of beer, CFL and I brewed an experimental batch recently. I created a simple SMASH (single malt and single hop) pale ale recipe. We divided the wort and pitched two different yeasts (American and Thames Valley). 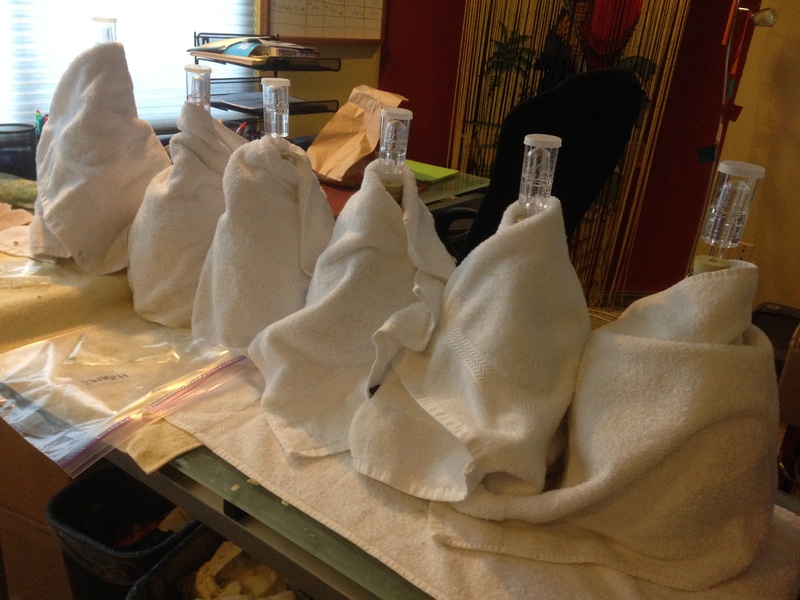 After several days, we further divided the proto-beer into six one-gallon jugs, which we dry-hopped (or not) in different ways. 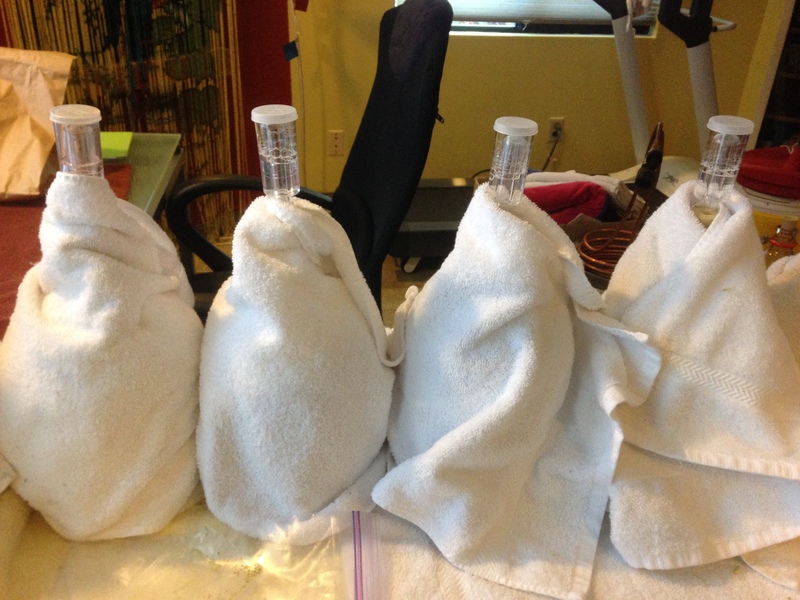 Don’t our little jugs look cute all bundled up and cozy in their matching towels? We bottled them a week ago and we’re anxiously awaiting side-by-side taste tests next week. Tomorrow I’m going to see if I can ride my bike a little further up the hill than last time… I made it up Hurricane Ridge Road to mile 2 the other day, but I still have 15 more to go! We’re busy! We’re happy! We’re not always so slow, but that’s okay. There is SO much to do and SO many miles yet to go! Happy New Year! As years go (and so they do, faster and faster it seems) 2013 was a rather great one. CFL’s and my casual decision last January 1 to “be more active” turned into a 365-day activity streak that is still going strong as we begin 2014. CFL’s approach to it was rather casual, but he never missed a day — even if it meant setting out on the 2.1 mile uphill/downhill neighborhood “lap” at 11:45 PM. Me? Of course I kept a spreadsheet, which now allows me to regale you with some numbers that still boggle my mind. Oh, and I drove just over 11,000 miles — much of which was long-distance driving to and from events (bike rides, concerts, brewfests, and the like) and trailheads. We brewed 21 batches of beer, and made the leap from extract to all-grain brewing. We have a never-ending list of brewing equipment that we want to buy (a bigger brew kettle to prevent boilovers, a plate chiller to cool the wort more quickly, a couple of pumps to save CFL’s back, the list goes on and on). So what’s in store for 2014? I think I’ll run a little less, since I won’t be training for a full marathon and doing the super-long runs. I think 900 running miles is a good goal. I plan to do a LOT more bike riding. I don’t have a specific mileage goal but I do have some events that CFL and I want to ride. I’ve got my eye on a new bike that I hope to buy before the end of January. I weighed my current bike and was astonished to learn that it weighs 33 pounds — no wonder I work so hard going uphill! The bike I’d like to buy will be at least 10 pounds lighter. I’m looking at my calendar and figuring out how I’ll weave together training for and participating in multiple running and biking events throughout the year. The Chilly Hilly on February 23 — 33 miles around Bainbridge Island with 2,675 feet of elevation gain. I’ll need that new bike for those hills! 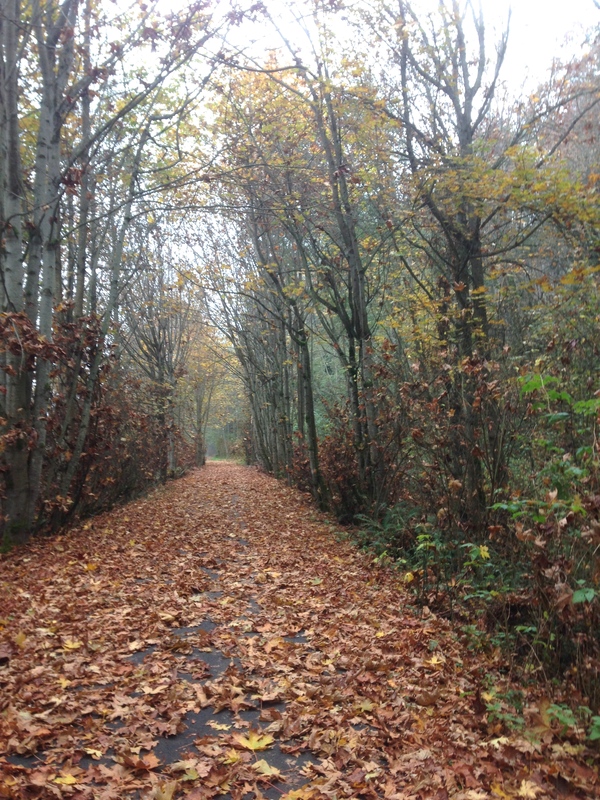 The Oat Run (Olympic Adventure Trail) — I’ll run this one and CFL may be a volunteer worker. North Olympic Discovery half marathon — this local race will be my fifth NODM and CFL’s first; he’s going to walk it. The Providence Bridge Pedal in Portland was so much fun last year that we’re going to do it again. Just us and over 15,000 other riders, riding over ten (count ’em) Willamette River bridges on closed roads and freeways. The Tour de Victoria will be our first metric century — a 100K bike ride around downtown Victoria, BC and its surroundings. We’ll be back in Victoria for this one. This is where I ran my marathon in 2013. For 2014 I plan to go back to the half (it will be my third Victoria half marathon), and CFL says he is going to walk the full marathon. We’ll see how he feels about that one when the time comes. I’m sure other events will come up, and we’ll fit them in somehow. These are just the major ones that will require planning and preparation. We have several road trips planned as well, all of which will include some brewery tourism. Yet even with all the training and traveling, we should have plenty of room on our calendars for hiking (I really need to do an overnight backpack trip this summer), walking around town, and hanging out with friends. And brewing, of course. I’m guessing that we’ll end up doing at least 2,400 total miles this year. That seems like a worthy and achievable goal. 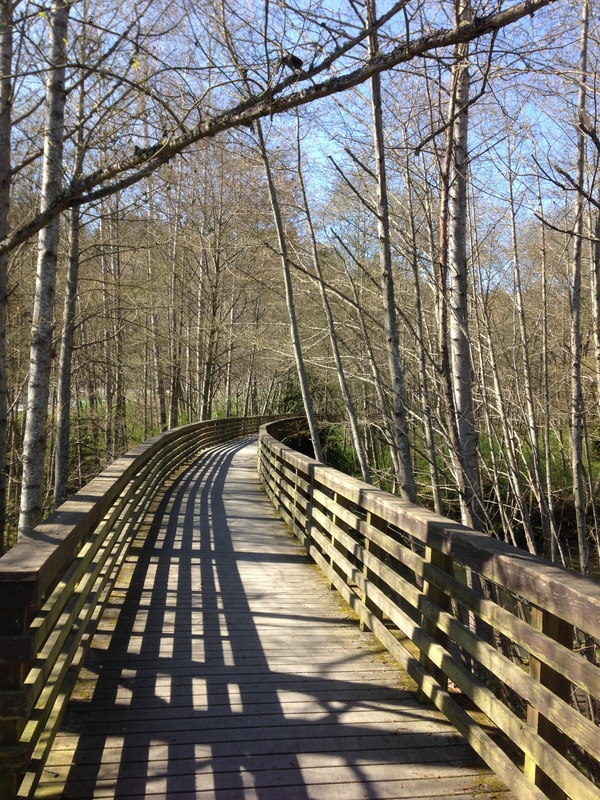 Right now, as I’m writing this, I’m thinking about an easy afternoon hike on a lowland forest trail. Although the sunsets are already noticeably later than two weeks ago, I’d better get out there while there is still plenty of daylight! What’s on your calendar? What new goals have you set for yourself in 2014? Well, that was quick! I knew October was going to be a busy month, but I had no idea I’d be so swept up by events that I wouldn’t have another chance to post here until mid-November. While the living has not been so “slow” lately, it has certainly been happy. October began with the Yakima Fresh Hop Festival, as documented in my last post. 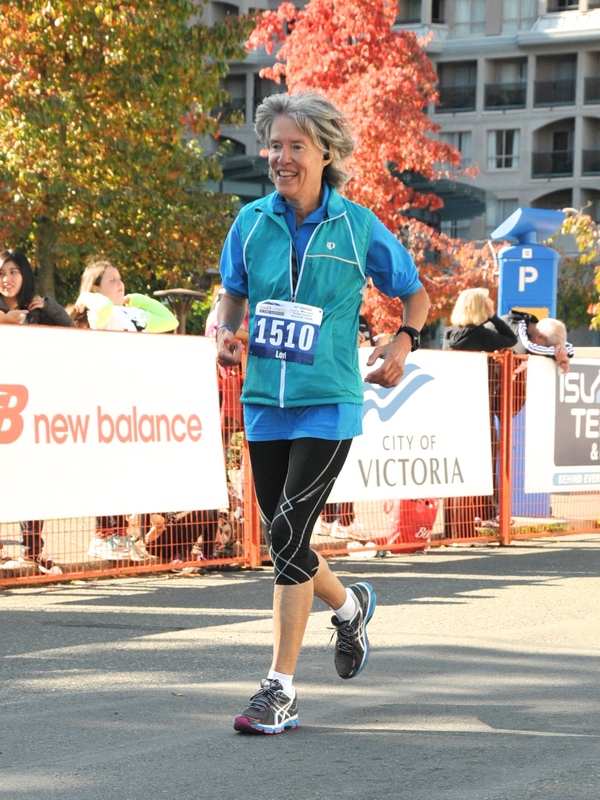 The following weekend was the Victoria marathon. As I’ve written here, I can now and forever call myself a marathoner! The weekend of October 19-20 we went to Seattle to see the Moody Blues for what I believe to be my 40th time (CFL’s second). They never disappoint, and this was yet another great show by my all-time favorite band. The following evening we attended the 10th anniversary celebration for the local region of the sports car club that I belong to. As a charter member of the region, I was among those who stood up to share memories of our early days. Good times! Our big travel event for late October was a trip down to Eugene, Oregon for a philosophy conference at which I presented a paper. My paper was a very preliminary attempt to make sense of what I have learned (and continue to learn) about running and personal transformation. I’m playing with the idea of the literal steps and place-to-place movement of my running “career” as a metaphoric movement through the course of caregiving, grieving, and re-creating one’s life anew. My paper was well-received at the conference, but I didn’t get enough feedback to determine which direction I want to go further with this. Here’s the dilemma I’m mulling over in my mind. I think these life experiences that I’ve had make for a good story, but I want to frame them conceptually as something more than a simple memoir. As a scholar/philosopher, I want to put them in a philosophical context — which would seriously limit the potential audience. At the same time, as a person who has actually had these very real and human experiences, I do want to make them accessible to others — not as a slick “self-help” book, but as some sort of a guidebook for the journey. I’m sure there is a happy medium there between conceptual “navel gazing” and pop psychology, but I can’t quite grasp yet what that middle ground might look like. So I think I will do some noodling around with alternate takes on writing projects and see whether the work finds the right direction, or at least the direction that it wants to go. Many times in the past, I have begun to write without having a clue where I might end up, and I have learned what I needed to learn in the process of writing. I sense that this will be another one of those times. That was October. Now, what the heck has happened with November so far? I think I must have exhaled and collapsed! We’ve brewed two batches of beer — a black IPA for Thanksgiving and an Old Ale for mid-December — and I’m tweaking my recipe for the imperial stout that we’ll brew next week to have ready for New Years. We keep talking about a hike up the Elwha River valley before winter really sets in, but we seem to be so busy from day to day that we haven’t blocked out a full day for a good, long hike. We haven’t let up on the daily activity streak, however — yesterday was day 317, and I’ve logged just under 1,900 miles of running, biking, hiking, and walking since the beginning of this year. This time of year, when everything changes suddenly and dramatically from green to gold and then to brown/gray, it can be difficult to escape a sense of the urgency and inevitability of passing time. The “slow happy” mantra is a reminder to ourselves to appreciate and make the most of NOW. But it can be difficult to resist packing too much into each NOW. Sometimes NOW needs to be a silent soaking-it-in time/place — even if we only get to be there in our memories or thoughts. I’ll try to remember to slow down and pay attention as I go about my busy day.